As I am moving to Alcester SD, we will offer the following 10.18 Improved Acreage at Auction located at 29820 – 477th Ave., Alcester SD; or from Beresford SD I29 Exit, go 6 1/2 miles east on SD Hwy 46, then south 1 mile on 477th Ave., 1/8th mile east and 1/4 mile south; or from Alcester SD – miles north on SD Hwy 11, then 1 3/4 west on 299th St., then 3/4 mile north on 477th Ave. Watch for Signs. Offering a 10.18 improved acreage with older 2 story (1.848 sq. ft.) 5 bedrooms, 2 bath home with the main floor consisting of a large living room w/ pocket doors, formal dining room, spacious kitchen with ample cupboards, one bedroom and full bath w/ tub/shower comb.. There is a front entry with covered porch and rear entry into small foyer. Main floor is carpeted over hardwood floors. Upper level contains 4 large bedrooms, hallway and staircase to walk-up attic. There is a full cement block basement (new in 1978) with propane gas furnace, central air, elec. water heater, 200 amp breaker service and a partially unfinished 3/4 bath w/ shower and laundry area. House is vinyl sided and has a NEW asphalt shingled roof (October 2018) and is serviced by a private 600ft. well and septic system and Southeastern Electric. This acreage is conveniently located 1 1/8th mile south of SD Hwy 46 between Alcester and Beresford SD. Outbuildings consist of a 22x26ft., 2 stall block garage w/ 2 door openers, 40x26ft metal machine shed w/ sliding doors, former milking barn and numerous other buildings utilized as storage or livestock buildings. This acreage is divided by 477th Ave. a township road. Acreage has many large trees and shrubs and is well protected from all angles with enough space for a few head of livestock or horses. This property has been in the Gabel Family since 1963 and never before offered on the market. 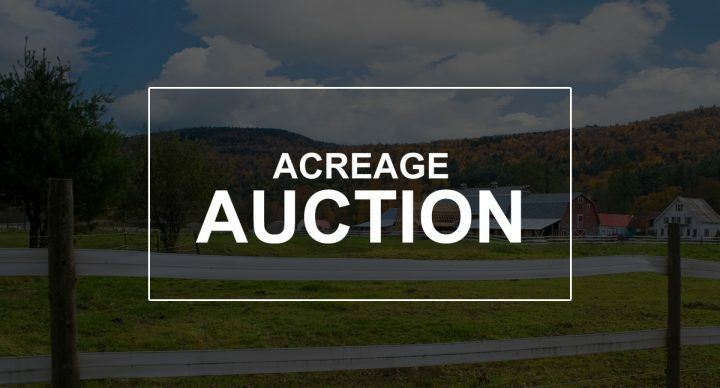 Make plans to inspect this property at an Open House and then attend this rural residential auction. For additional inquiries, contact Auctioneers or visit www.souvignierauctions.com for photos. Legal Description: T. 1 of Gabel Addition in the NW1/4 of Sec. 8, Twp. 95, R. 49W., (Alcester Twp. ), Union Co., SD. Terms: CASH. $20,000.00 non-refundable earnest money payment sale day with the balance due at closing on or before Dec. 27th, 2018 with full possession. A warranty deed and owner’s title insurance policy provided with the cost of the policy and the closing agents fee (Charles Haugland, Attorney) to be split 50/50 between the buyer and seller. The 2018 real estate taxes will be paid by the seller with the buyer to assume the 2019 real estate tax amount of the newly platted acreage. This property has been recently surveyed and platted at the seller’s expense with any new fencing requirements, if any, to be at the sole responsibility of the buyer. This property is being sold in “AS IS” condition with no buyer contingencies whatsoever, and sold subject to any existing easements, restrictions, reservations or highways of record, if any, as well as any Union County Zoning Ordinances. The Licensees/Auctioneers in this transaction are acting solely as agents for the seller with the information contained herein deemed to be correct but not guaranteed. Property sold subject to confirmation of the owner.